Mozaika has long been one of our favorite restaurants. It's not perfect, but what is? It is certainly good enough for a spot in the regular rotation. We went recently, but I'm also including some dishes from a visit many months ago. The dining area is one long room below street level. Lighting is usually relatively low, and the sense of intimacy is enhanced by the deep red-colored walls. On our last visit, the chef started us out with an amuse bouche. 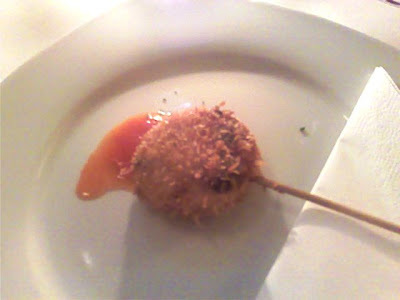 It was a panko-crusted piece of fried chicken on a stick. A lollipop, if you will. Nice. I started with a long-time favorite, what they call "tuna au roastbeef." (196 CZK). I've always thought the name was a bit silly -- it's actually seared tuna. But that doesn't take away from the taste. It was prepared perfectly, with a deep red center. It came with a slightly sweet soy sauce on the side. It also came with maki rolls filled veggies. The rice in the rolls was delightfully creamy. Love it. I must apologize about the bad lighting that perverted the quality of some of the photographs. Unfortunately, the LED flash on my mobile phone's camera died (a sentence I never imagined I'd write 10 years ago). 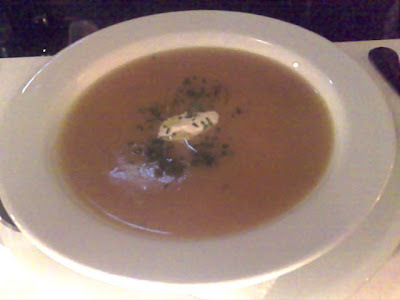 V ordered the soup from the pumpkin-themed specials menu for 59 CZK (they often do themed specials). It was thick and you could actually taste the pumpkin (unlike some other "pumpkin" dishes I've had in Prague restaurants). It was on the salty side, which V liked. I wished for a hint of sweetness, but that's just my personal taste. 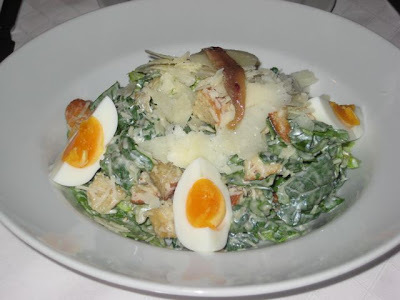 During our long ago visit, I tried the Caesar salad (155 CZK). I didn't like it so much. It had spinach leaves in it, which didn't work on a number of levels. First, I wished it was just had Romaine lettuce in the classic style. Second, the spinach was past its prime and had lost all its crunch and become a bit rubbery. Third, there was too much dressing. The boiled eggs were done perfectly, but they were also not what I'd expect on a Caesar. It's not that I'm against variation. I just didn't particularly like this version. For a main course, V had wok stir fry with shrimp for 289 CZK (a particularly perverted photo). 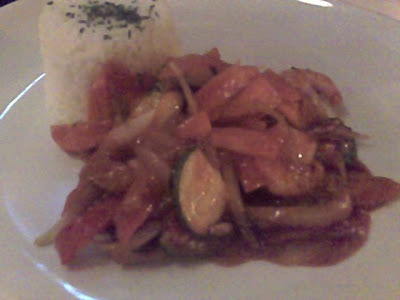 There were lots of veggies, lots of shrimp, and rice on the side. V liked it. I thought it was a bit too sweet, and I generally enjoy sweet dishes. 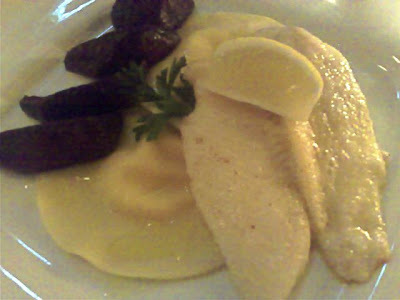 I got the lemon sole from the specials menu (318 CZK). The light, buttery fish was cooked in a lot of butter, and if you don't mind calories with your fish (and I don't), it was terrific. It came with some big pumpkin ravioli on the side. I wished for more. There were also pickled beets on the plate. I didn't like these so much. They had a very earthy flavor that didn't please me. Overall, a big thumbs up for this special. I've seen sole on other restaurant menus before, but rarely ordered it because the prices were so high. Mozaika's was a great deal. On earlier visits, I've tried the restaurant's Angus beef burger (199 CZK). Some people rave about it. 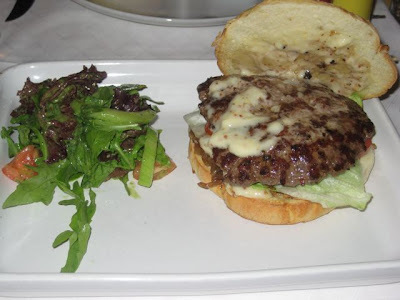 The hamburger was a hefty meal, even with the side salad instead of fries, but it's not among my favorites. The meat was very peppery, a little too much for me. It was served on a large spinach bread bun, which was OK. I ordered it once with both bacon and cheese. When combined with the grilled onion, lettuce, and tomato, it turned into a gloppy mess and hit my stomach like a rock. Just too heavy for me. 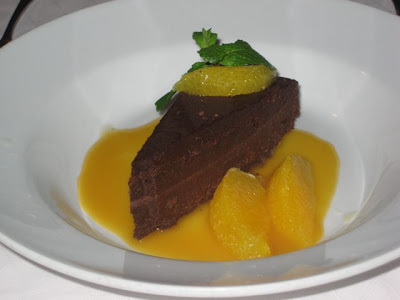 In the past, I had a special dessert of a chocolate chili cake (99 CZK). It was a dense, death-by-chocolate style slice, accompanied by fresh orange wedges with all the skin removed. The chilies didn't assert themselves at first. The heat built up slowly. By the time I finished, there was considerable burn. I liked it. 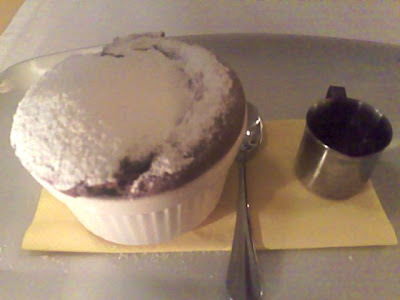 The most recent dessert I tried was the chocolate souffle (109 CZK). It could have been great, but suffered from weak execution. First, there was way too much powdered sugar on top. Second, the center was mostly still liquid and only the outer edges had set. I understand some might like it this way, but to me, it was more like a fondant than a souffle. An unfinished work of art. So, these dinners were a mixed bag -- some good, some not so good. 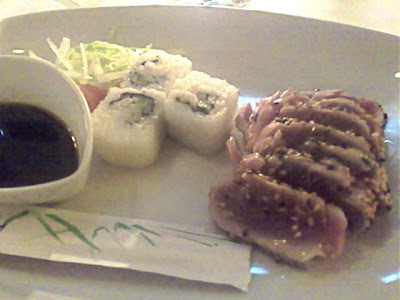 Why, then, is Mozaika a favorite restaurant of ours? 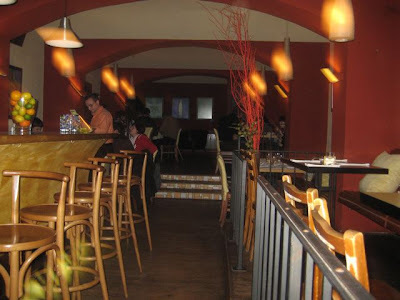 The service is generally quite good and friendly, it is a nice looking place near our flat, and dishes like the sole and seared tuna and a few others put such big smiles on our faces for reasonable prices. There are enough good deeds that a few naughty sins are overlooked or quickly forgotten. What a great blog project! 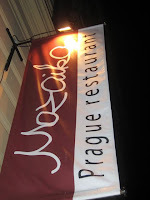 Whenever we've gone to Prague, my husband will search high and low for all his favorite Czech foods. Since I'm not big on Czech food, it's been an interesting dilemma--so I appreciate seeing your blog and the amazing things you've found. We just moved to Berlin and started blogging about it. I'm pretty sure we'll be searching for a Czech restaurant here, too. Keep up the great reports! what they call "tuna au roastbeef." 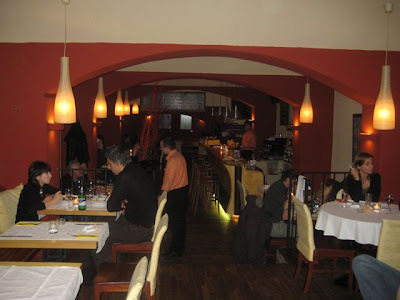 (196 CZK)... amazing , this is my signature dish.. and I must tell you, its all in the sauce... of course, you need good tune, but that is not hard to find.... I have been thinking about this for some time, but since you are into food and im a sushi chef, we can set together a date a give it a try.... I do not know you or you me... anyways i can buy the things and give you the bill, it would be way cheaper and you(we) can eat untill you are stuffed...eventually I'd like to cook privately and charge a fee, for small parties or get togethers... the quality is there! Wonderful site, just found it. 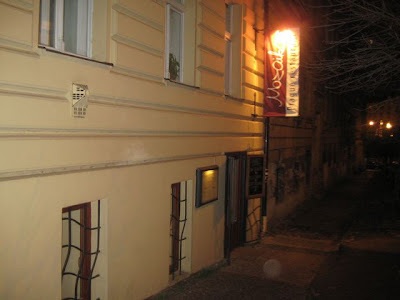 I'm a frequent visitor to Prague and will be there over Thanksgiving. Your reviews are excellant and I can't wait to visit some of these establishments. Do you know if any place offers a Thanksgiving meal?